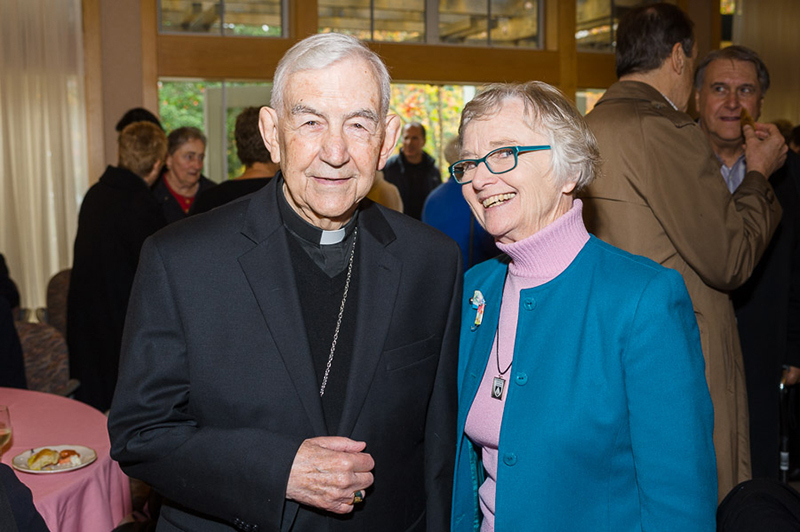 Archbishop John Quinn, presider, with Sister Maureen McInerney, Prioress General, at the reception. On December 6, 1850 three Dominicans arrived in San Francisco on the steamer Crescent City after a long journey that included a mule-back crossing of the Isthmus of Panama: Mother Mary Goemaere, Bishop Joseph Sadoc Alemany, and Father Sadoc Vilarrasa. On Sunday, December 6, 2015, the Dominican Sisters of San Rafael commemorated the event with a Mass at St. Raphael Church and a reception at the Dominican Sisters’ Center, the site of their motherhouse since 1889. Archbishop John R. Quinn, Monsignor Romulo Vergaro of St. Raphael Parish, and Father Robert Haberman, Director of Campus Ministry at Dominican University, were the presiders. Sister Abby Newton, member of the leadership team, welcomed all to Mass of celebration at St. Raphael Church. In October of 1850, a Belgian woman living in a Dominican monastery in Paris, responded to the plea of Bishop Alemany to come to the mission lands of the United States. Sister Mary of the Cross Goemaere left France believing she was going to a Dominican school in Ohio to teach French. By the time they reached New York the plans for her had changed; she was now going to California. I have always felt that the bishop was not entirely forthright with her, but a more benign interpretation might be that in the voyage across the Atlantic, he saw in Sister Mary of the Cross the attributes of discipline, courage, constancy, faithfulness and sheer grit that made him think she had what it took to come to California and found the first congregation of women religious in his new diocese to bring education, especially religious education to children on the frontier. Joining in the celebration were members of the San Domenico School community, celebrating their 165th anniversary of the Dominican tradition of education, from the first school Mother Mary founded in Monterey that moved to Benicia, to San Rafael, and is now in San Anselmo. Also warmly welcomed were the Dominican University of California alumni, who merged their annual Christmas celebration with this historic event, affirming the role the Sisters has in founding the school in 1890. Guests enjoyed watching a special video, highlighting the vocation journeys of several San Rafael Dominicans. It was created by DSC Executive Director Pat Farrell. 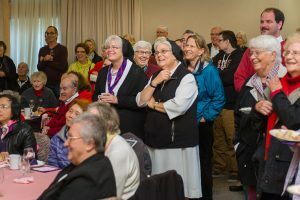 Sister Patricia Farrell, Executive Director of the Dominican Sisters Conference, produced a beautiful video presentation that was shown to the gathered guests at the reception. 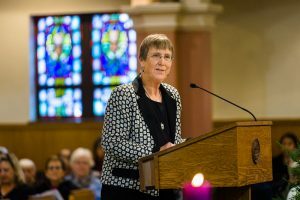 She wove the vocation stories of seven of the San Rafael Dominicans from the oral history footage that has been filmed over the last several years. The Sisters also used the occasion of their 165th anniversary to refresh their logo. The new visual representation expresses vitality and faith in the future; the added flames express the passion for truth, love and justice.